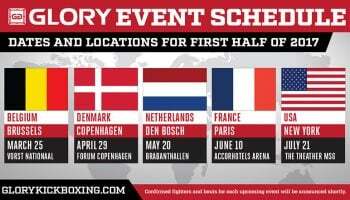 Before GLORY storms into the Chicago area with GLORY 11 Chicago, they’ll be in Los Angeles for GLORY 10 Los Angeles, whch will showcase four of the best Middleweights in the world, as well as see a main event between K-1 legend Jerome Le Banner and former PRIDE and Strikeforce fighter Sergei Kharitonov. There are a ton of great fights on this card, including some of the best 70kg fighters squaring off. GLORY 10 LA goes down on September 28th at the Citizen’s Bank Arena in Ontario, California and will be the last GLORY event to air on CBS Sports Network.